We’d love your help. Let us know what’s wrong with this preview of Wild Moms by Carin Bondar. A journey Being a mom is a tough job—but imagine doing it in the jungle or out on the safari, faced by the ravages of the elements, a scarcity of resources and the threat of predators prowling at all times of the day and night. 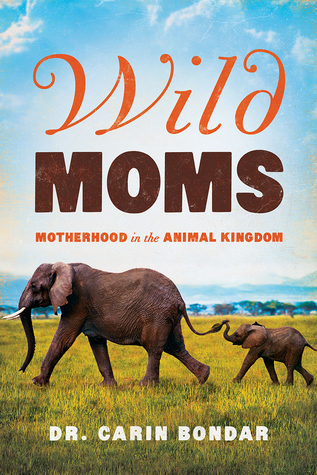 In Wild Moms, Dr. Carin Bondar takes readers on an enthralling tour of the animal kingdom as she explores the phenomenon of motherhood in the wild. To ask other readers questions about Wild Moms, please sign up. I decided to read this book because I thought it would be a good encompassing book of different animal mom’s and I was right. I appreciated learning about so many different animal motherhoods and her writing was full of research. I’m an animal lover but even I learned more about common animals that I thought I already had a good foundation on. The facts were fascinating but I give it four stars because sometimes it felt more like I was reading a fact sheet of bullet points than reading a fluid b I decided to read this book because I thought it would be a good encompassing book of different animal mom’s and I was right. I appreciated learning about so many different animal motherhoods and her writing was full of research. I’m an animal lover but even I learned more about common animals that I thought I already had a good foundation on. The facts were fascinating but I give it four stars because sometimes it felt more like I was reading a fact sheet of bullet points than reading a fluid book. Definitely a keeper though with all its knowledge and insight it contains on the animal world and motherhood. Even motherhood in the animal kingdom is kind of brutish, although there are some bright spots (anthropomorphically speaking). It's not all cuddles, but the variety of ways that have evolved to reproduce is quite amazing. I found Wild Mom's wildly interesting. I am truly disturbed by "Silvana rated it did not like it, "I am truly disturbed by the degree of anthropomorphism in Dr. Bondar's writing which unfortunately makes the book unreadable." HUH? Anthropomorphism; noun: the attribution of human characteristics or behavior to a god, animal, or object. I hardly think that finding seemingly human characteristics is somehow negative. Further, I don’t think it was her intention to imply such. However, even if she did I found Wild Mom's wildly interesting. I am truly disturbed by "Silvana rated it did not like it, "I am truly disturbed by the degree of anthropomorphism in Dr. Bondar's writing which unfortunately makes the book unreadable." HUH? I hardly think that finding seemingly human characteristics is somehow negative. Further, I don’t think it was her intention to imply such. However, even if she did intentionally, wouldn’t that enable the reader to make a bridge toward understanding the subject a little better? I scarcely found any “Anthropomorphisms” and none that came within a scintilla of "unreadable"!? I agree with Heather and Anthony Faber’s Goodreads reviews. Specifically, “the variety of ways that have evolved to reproduce is quite amazing” This was a fun book. Carin Bondar is a PhD Biologist, author and TV/Web Host. She is a psychotherapist, jungle explorer, glass artist, former ballerina, TED speaker and mother of 4. Despite being fabulous, Dr. Carin is forgetful and sometimes disorganized. She loves to cook - and although dinner may reach the table later than usual, it's almost always delicious.